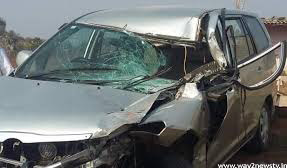 The car accident at Muppalla in Guntur district. One died during the 2 o'clock in the morning on Saturday. All four have been injured. The deceased is Ashok Sattenapalli who is serving constable duty in the DSP office. They are going to chirala from sattenapalli for an occasion at that time this incident is happened. The injured have been shifted to a private hospital in Sattenapalli.